Flying cows, singing frogs and bike-riding ducks. They’re the stuff of many children’s animal picture books, igniting imagination and bringing sweet dreams. Often based in fantasy, however, the genre of children’s animal-based fiction rarely reflects the issues real animals sometimes encounter—something Emilie Buchwald and The Gryphon Press are working to change. Showcasing a range of important issues in humane education, the topics of Gryphon books explore animal abuse, neglect, overpopulation, adoption and abandonment, the joys and responsibilities of pet ownership, teaching empathy to children, eliminating puppy mills, choosing a pet for life, and family farming. The inspiration for Gryphon began when Emilie adopted her canine companion, Sam, and started following the blogs of The Humane Society of the United States (HSUS) and the American Society for the Prevention of Cruelty to Animals (ASPCA). There she discovered many problems facing animals, including neglect, and sometimes abuse, caused by children. Shocked, Emilie—a seasoned writer, editor and publisher—researched the literary market to see what books existed to help children understand the companionship and care of animals. Unfortunately, she found very little. Being a small, animal-themed press, Gryphon’s focus is narrower than many publishers and the number of titles it produces is smaller, but the process is just as challenging. It’s a tall order, but one Gryphon achieves beautifully. One of its first books, “Buddy Unchained”—an endearing tale about a rescued puppy written by Emilie as Daisy Bix—won ASPCA’s Henry Bergh Award for Best Children’s Picture Book and the HSUS KIND Award and put the publisher on the map. Since its founding nine years ago, Gryphon’s titles have continued to win award and accolades and have brought enlightenment and inspiration to readers far beyond Minnesota’s borders. Collaborating with HSUS, The Association of Professional Humane Educators and other animal-welfare organizations, Gryphon’s award-winning books have been used far and wide as classroom tools and springboards for discussion about animal well-being. Recently, HSUS purchased over 700 copies of three Gryphon titles—”Buddy Unchained,” “Are You Ready for Me?” and “Call the Horse Lucky”—as part of a humane education outreach effort in Puerto Rico. In 2013, the Hawaiian Humane Society used “It’s Raining Cats and Cats!” to educate over 10,000 students in Oahu, grades K through 5, about proper animal care relating to spaying/neutering and overpopulation. Gryphon is currently partnering with RedRover—an organization dedicated to bringing animals out of crisis into care—to produce a Spanish language edition of “Buddy Unchained” for RedRover’s Readers Program. For more information about Gryphon’s titles or how to order them, visit www.thegryphonpress.com. Humane educators, shelters, teachers and 501c(c)(3) organizations get a 50 percent discount when they purchase by the box directly from Gryphon. Almost every parent has heard the question, “Please, can we get a dog?” Now there is a book that will help families answer that question, a book that supports either answer. “Are You Ready for Me?” shows what life will be like with a dog, both the responsibilities and the joys. 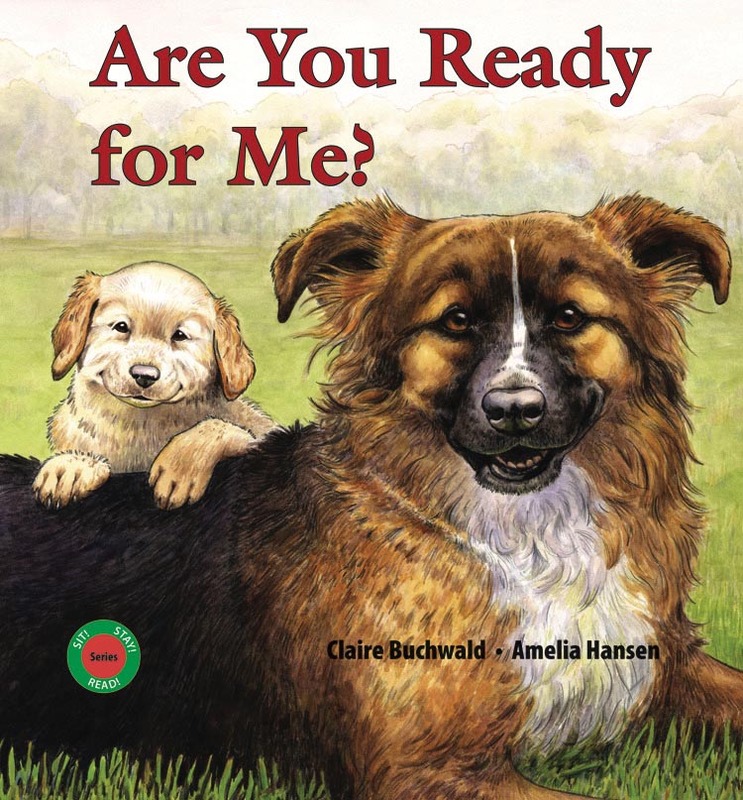 In the text, a dog and a pup, waiting to be chosen at an animal adoption center, ask two children questions about how they will be treated. Children and their parents will recognize what it will mean on a daily basis to bring a dog into the family. Families who choose to adopt a dog can use this book to prepare for and to anticipate the big day. Parents can also draw on the book to review responsibilities of family members to pets they already have. What is life like, day after day, for a dog kept outdoors in all weather on a chain or a rope, alone all day—a dog whose owners, for the most part, forget that he’s alive? Buddy, a lovable mixed-breed dog, has had such an existence. Happy in a new home, Buddy tells the story of his former life of neglect, abuse, and finally, rescue, to live a good life with a family that cares about him. Information is included for parents and other adults about resources they can readily contact when they encounter a dog being abused. While visiting her grandmother in the country, Mel discovers a neglected horse. Moved by the sight of the rib-thin pinto with the sad, glazed eyes and eager to help him, Mel starts a rescue process that results in the pinto’s being moved to a horse rescue ranch to revive him and treat his problems. At the ranch, Mel learns about horse care and continues to bond with the horse she has named Lucky. When Jim and his mom return home from the vet with Molly the cat after her surgery, Jim asks, “Why did we keep Molly from having kittens? I like kittens!” In this imagined journey into the future, Jim’s mom shows the many ways that Molly’s (and her kittens’) potential for multiplying would change their lives—and not for the better! This book will appeal to kids and adults with its detailed art that encourages looking through the book many times. This entry was posted in Articles on September 11, 2015 by wpadmin.